When we reconvened with our teacher fellows for a daylong meeting of teacher inquiry, we started by facilitating a restorative healing activity: making mindful nature mandalas. 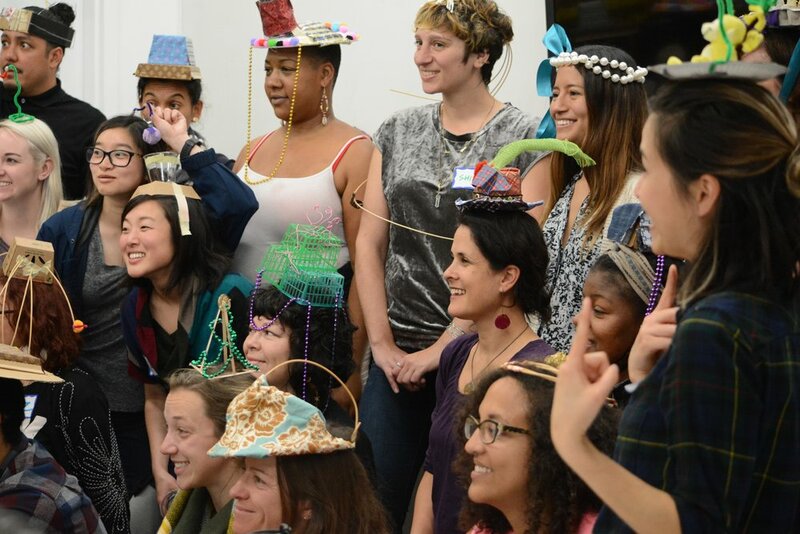 This arts-integrated practice is not new — we learned it in the Integrated Learning Specialist Program, from Jessa Brie Moreno of Studio Pathways, who learned it from Dr. Monique LeSarre of Rafiki Wellness and the California Institute of Integral Studies. Agency by Design Oakland Fellows participate in nature mindful mandalas as a restorative community healing activity before and during their teacher inquiry during a March daylong meeting. While much of our March daylong focused on the intellectual heavy-lifting of teacher action research, we returned to the joys of making in our midday design challenge. 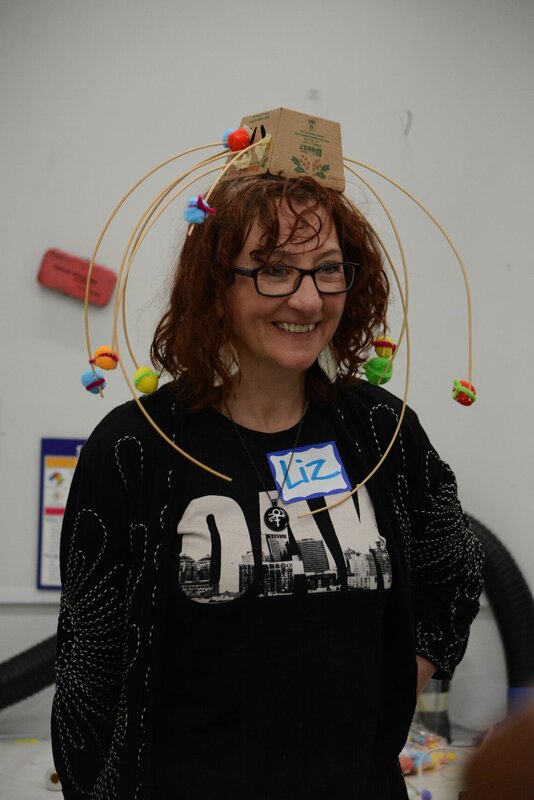 Using the prompt “make something that balances on your head that shows where you are with your inquiry,” our teacher fellows synthesized their inquiry-in-process through structural headpieces. Seeing our fellows’ joys in their creations, we also return to Ginwright’s healing centered engagement. He writes, “we know very little about the systems of support required to restore and sustain well-being for adults. Healing centered engagement has an explicit focus on restoring, and sustaining the adults who attempt to heal youth — a healing the healers approach.” While there is not much “data” on what systems of support are required to restore and sustain well-being for adults, Agency by Design Oakland aspires to be a system of support for our community of Oakland educators. 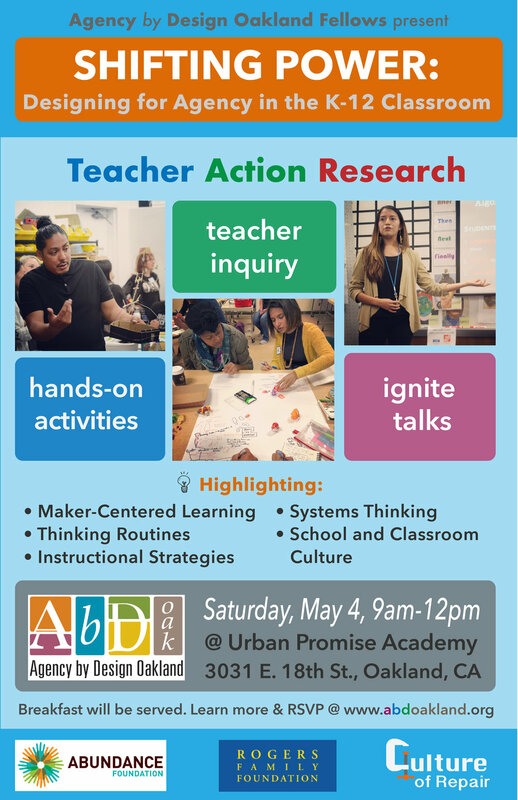 As we near the end of this year’s fellowship calendar, we invite you to come see what our teacher fellows have been innovating at our upcoming culminating event (see details below), and to come share in their joy and creativity.